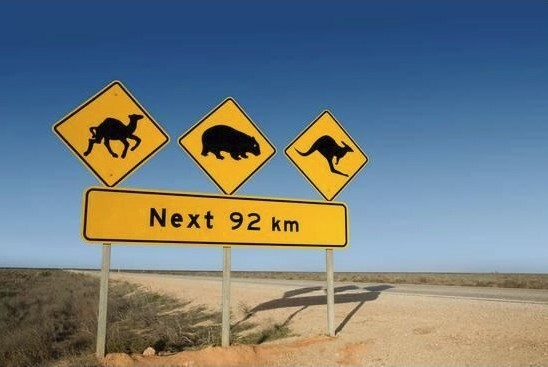 Yes, we have camels in Australia, or more specifically in the Australian Outback deserts. Lots of them. In fact, Australia's wild camel population is the biggest in the world. Everybody knows that camels are not native to Australia. Nevertheless, they are perfectly suited to the Australian Outback environment. Made for it, so to say. But this first camel was soon followed by others. 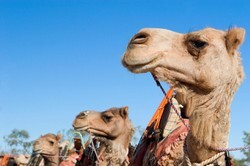 24 more camels arrived in Australia in 1860 to be part of the Bourke and Wills expedition. And in the next fifty years an estimated 10 000 to 12 000 camels made their way to Australia! 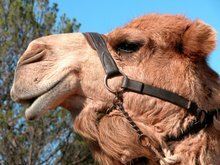 The camels came to Australia mostly from India and Palestine, and nearly all of them were dromedaries (the one humped variety Camelus dromedarius). Apparently there were only about 20 two humped camels (bactrian camels of the species Camelus bactrianus) imported during that time. Camels can go without water for long times. Of the estimated 350 or so plant species that grow in the Australian Outback deserts, camels eat 325! Camels don't need roads. Their huge feet allow them to easily walk over soft sand that would bog anything with wheels. Also, a camel is old enough for light pack work at only three years of age, and can go on to work at least until it's forty. That's a long working life. The loads that camels can carry are impressive, too. A grown bull camel will carry up to 600 kg! It was the camels, and the camel drivers or cameleers, that opened up the Australian Outback. The camel drivers came mostly from Afghanistan, but also from Pakistan and the Turkish Empire. The camels and the cameleers, their endurance, knowledge and labour skills, were crucial in the Australian Outback in the early days. Not only the first explorers relied on camels as they traversed the inhospitable Australian desert regions. Progress and development took their usual course. By the 1920s the camels' working days were numbered. Roads, railway lines and airstrips were built, and eventually the camels couldn't compete with the roadtrains, the cessnas and the locomotives any more. The camels in Australia multiplied, and multiplied, and keep multiplying... They live in the arid central deserts, half of them on the Western Australian side, another quarter in the Northern Territory, and the rest in South Australia and Queensland. Nobody knows how many there are exactly now (2012), some say around 600 000, some say they he numbers have reached at least one million. All agree that there are too many, and the number is expected to double again in the next eight years. The Australian Outback currently has to cope with an extended draught, and the camels are thirsty. Even camels need water eventually, and in their search for water they have become a serious problem. Camels are also a threat in the undeveloped desert regions. They compete with native animals for food and water, they are destroying Aboriginal sacred sites, Aboriginal food sources, national parks, anything in their path basically. Camels are seriously upsetting the balance of the fragile Australian desert ecosystem. At the moment there is mostly a lot of noise and pleas that something needs to be done. Culling will need to be part of the solution, no doubt, but most people realise that the Australian camels are also a valuable resource. Let's see what happens and what our politicians can come up with. If you travel through central Australia chances are you will see camels. They're everywhere... The biggest herds live in the desert regions near the borders of Western Australia, the Northern Territory and South Australia. Watch out, because they stand on the highway, too, and you don't want to hit one. If you won't be here for long and want to make sure you see camels, or if you want a closer encounter, seek out one of the camel farms. There are over 50 Australian camel farms, trying to lure domestic and international tourists. You can go for a ten minute camel ride, or a three week camel safari. Most camel farms are in Western Australia or the Northern Territory, there are some in Queensland and South Australia, and even some in Victoria and New South Wales although those states don't have any wild camels. You should be able to find one wherever you are. 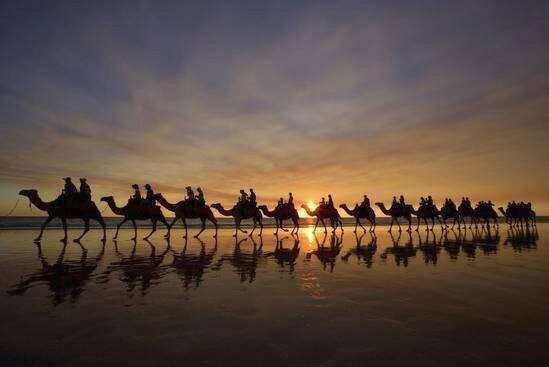 Popular rides are the short rides (tourists, always in a rush...), like for example the ones offered by camel farms in the Alice Springs/Uluru area where all the big coaches stop, and also the well known camel sunset rides on famous Cable Beach in Broome.